Domínguez-Gaona, M., López-Bonilla, G., & Englander, K. (2012). Self-access materials: Their features and their selection in students’ literacy practices. Studies in Self-Access Learning Journal, 3(4), 465-481. Autonomous, self-directed language learning is the literacy practice that self-access centers aim to promote. Much of this activity occurs when students interact with the equipment and the materials available in the center. These resources, in many ways, become the core of the learning environment, and, therefore, it is critical to understand what learning is provided or afforded through them. In this study, we examine the literacy practices of students in a self-access center in Mexico, focusing on the materials. We combine description and analysis of materials, student observations, and interviews to identify the learning students perceive those resources afford and the criteria they employ to make decisions concerning their use of the materials. This investigation is accomplished through the theoretical perspective of New Literacy Studies, because it provides a unique and rich socio-cultural approach to language learning. As a result, we determined that affordances of the materials are constrained. We also identified five different criteria students use to choose materials, but despite their personal criterion, we found they often do not have a clear direction and purpose for their choices. In many language learning environments, self-access centers provide students with the opportunity to develop language skills and self-study strategies (Holec, 1981; Benson, 2001; Gardner, 2011). Each center plans, organizes and implements a learning supporting structure to achieve its academic goals; accordingly, they all offer a wide variety of human and material resources to assist users. When centers are at their planning stage, resources are obtained to ensure suitable support for the users. The resources may include any combination of the following: a space, self-access materials, technology, activities, training, tutors, a tutoring system, a system for feedback and self-assessment, and a system for evaluation (Gardner & Miller, 1999). However, the presence of these elements does not guarantee effective learning by students. In this article, we describe and analyze part of the supporting structure of a self-access center (SAC), the materials, and the way they are used by university students in a Mexican university. We provide an analysis of the materials and a description of the actual use of these resources, including the students’ criteria in choosing a particular type of material. This analysis leads to a discussion of the language learning afforded at the site. With the advent of the ‘social turn’ in applied linguistics (Gee, 1996), literacy is considered a social practice, not merely an individual cognitive and silent act. According to New Literacy Studies, the name given to a line of research that emerges under this new socio-cultural perspective of literacy, literacy practices are social practices mediated by texts of different kinds immersed in a context that shapes them. 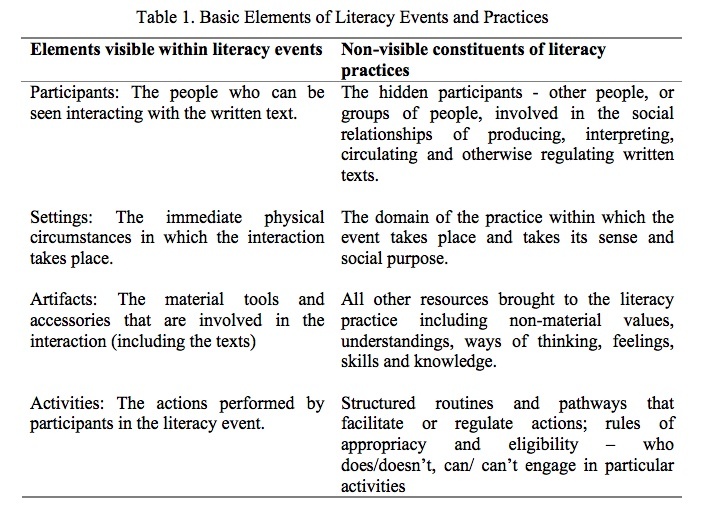 New Literacy Studies, exemplified by Hamilton (2000), offers an analytical framework for investigating the interaction among texts, people and context. Hamilton identifies two types of elements that constitute any literacy practice: those that are visible and those that must be inferred. The visible elements are the participants of the practice, setting, artifacts, and the activities performed; the elements that must be inferred are the hidden participants, the domain of the practice, other resources such as values, understandings, ways of knowing and thinking, and the routines that structure the activities observed (Hamilton, 2000, p. 17). In Table 1 we summarize this framework. We based our theoretical framework for this research on Hamilton’s approach for understanding the self-access center as a social context. By examining the social context in this manner, we can determine the affordances or possibilities for autonomous language learning that are provided to students learning a foreign language: English. Participants are students, tutors, and administrative staff. Setting is the physical arrangement of the space. Artifacts are the physical resources that support students in their learning. These are the materials and the equipment available at the center such as books, magazines, in-house produced (adapted) materials, multimedia, and computers. The hidden participants include the designers of the center and the administrators. The domain includes the university and the center’s institutional agendas, which are, one way or another, encouraging autonomous language learning. Other non-visible elements include the knowledge, values and understanding participants bring to the practice. Thus, the knowledge and understanding of autonomous language learning that the designers and students bring are core elements so that “learners are given the possibility consciously to be involved in their own learning” (Dam, 2000, p. 49). 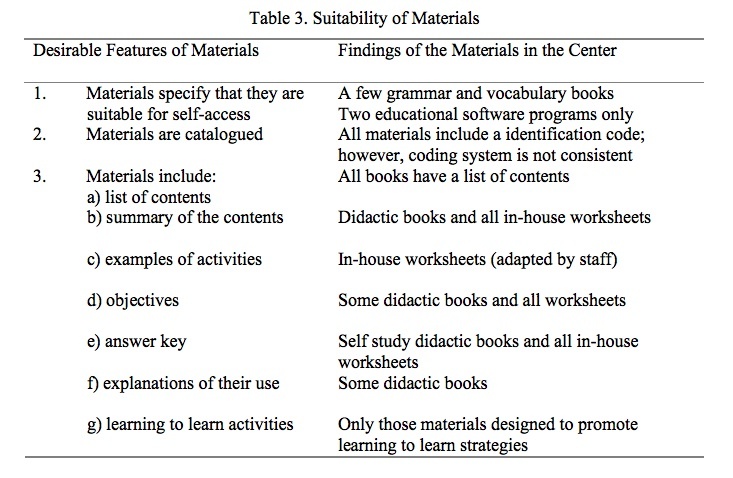 In this study we focused on one salient element of the learning support structure, the materials as artifacts of the literacy practice in the self-access center. Most of the materials in self-access centers can be classified in different ways. They may be authentic, didactic, published language learning materials, and/or adapted and designed materials that fit the students’ needs in each setting (Gardner & Miller, 1999). Materials, which are one type of artifact in Hamilton’s (2000) framework, are, to some extent, the core of some self-access centers. They are the principal sources of language learning input for students. The students use materials in order to engage in language learning activities such as reading books, playing board games, answering exercises, and listening to recordings. Sturtridge (1997), states that students’ acceptance or rejection of these centers might be heavily influenced by the quality of the materials. When acquiring, designing and adapting materials, it is necessary that these materials enable students to use them independently, without the direct control of the teacher (Tomlinson, 1998). Several authors (Dickinson, 1987; Sheering, 1989; Tomlinson, 1998) have suggested the features materials should have. Importantly, Reinders and Lewis (2006) identified a set of specific features to evaluate self-access materials to allow more effective practices at self-access centers. To determine those features, first they reviewed the work cited above among others. Then they applied a questionnaire as proposed by Gardner and Miller (1999) to gather data about what the students at the SAC thought was good material for self-access. Ultimately, they created a checklist to evaluate materials that focused on the selection, the access, the learning process and learning to learn features. These are the characteristics of the materials they identified: materials mention they are suitable for self-access study; explain the level they are recommended for; explain if there is a need to be used in a sequence; and include an index, a table of contents, a detailed map, a glossary and previews of chapters or summaries. Materials should provide examples of how to carry out activities, objectives of tasks, answer keys and criteria students could follow to develop the activities Materials should also comprise learning to learn features such as notes about the learning process and ways to establish goals. The research was carried out at a self-access facility of a language center of a large public university in Mexico. The university offers courses in several languages, English being the most popular. The weekly English course consists of six levels comprising of eight hours of classroom work and two hours of self-access work. This self-access facility is a place where students are expected to practice what they have studied in class and to develop their language skills independently. The center has room for 200 users and is open from Monday to Saturday. It is managed by a coordinator and there are tutors who support students through different activities (training, advising, solving simple doubts, activity-organizing, etc.). The research questions that guided our project were: What kinds of materials are provided at the center to support students’ learning? Do these materials possess desirable features of self-access materials? Based on the activities observed and students’ comments, what are the decision-making strategies students employ to select and use materials? We followed a qualitative approach (Holliday, 2007) with the purpose of providing a rich account of a range of factors that could help us first identify and then describe, analyze and interpret the elements that constitute the supporting structure of a self-access center studied as a social context. The findings we present in this article are part of a larger study about the learning affordances of the supporting structure provided by the self-access center. Here we present the findings regarding the materials of the center. This visible element of the self-access center merits focused attention because of its central role in affording students autonomous language-learning opportunities. We observed 12 university students who were enrolled in a weekly English course, two students working in each of the self-access center areas: video, conversation, computer, audio, and four in the reading and writing area. Most were enrolled in the first or second level of the English course offered in this institution, and were in the first two years of their university program. Their age ranged between 19 and 24 years old. To understand the structure of this self-access center, founding documents and regulatory procedures were consulted. To identify the materials available for student use, we reviewed catalogues and interviewed the coordinator of the center. To understand the students’ experiences and strategies regarding their use of materials, the 12 students were observed and video-recorded for the length of the session and an observation form was filled out. In this form we registered the length of the activities, the number of participants, a description of the setting, a description of the materials and other artefacts employed, and a description of the activities. All the visible elements of the events were observed and noted. When possible, materials that the students used during the observation were collected or recorded visually. On average, each session lasted 45 minutes. The students were interviewed immediately after each observation with questions concerning their decision making process and their knowledge about the center. The interviews were analyzed using a qualitative content analysis methodology (Mayring, 2000). First we wrote descriptive codes for open-ended questions. After several independent readings and coding of the data by the first and second authors, codes were later refined and grouped into categories. The resulting categories helped us identified the predominant topics in students answers about the self-access center, the materials, and their own activities at the center. The social context of the SAC is supported by a system comprised of physical and human resources which should allow students to engage in unguided activities assisted by guided tasks. The physical resources are the artifacts (materials and equipment) and the human resources are the participants (students, tutors and teachers) of the literacy practices that occur in the center. 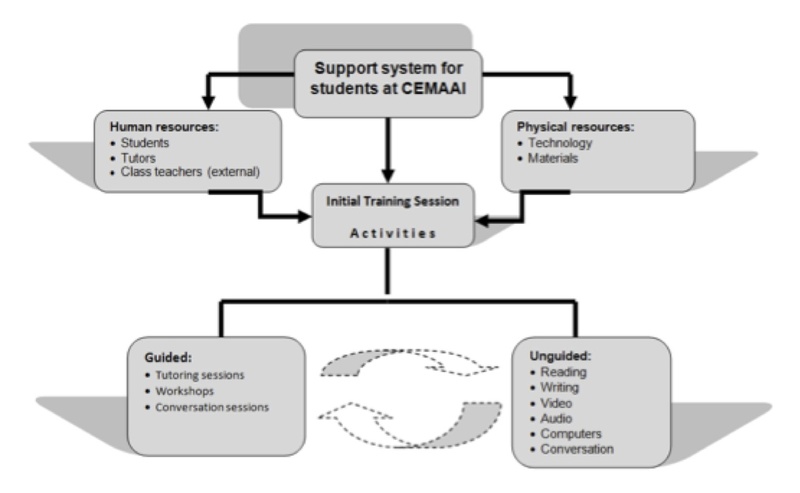 Figure 1 presents an overview of the implicit design of the support system at the center based on the founding documents and regulatory procedures (Plan de Trabajo del Centro, 2003; Reglamento del Centro, n.d.) The regulations state that users have to attend a two-hour orientation in which a tutor introduces students to self-access learning work. Then, students start working independently and are supported by guided activities such as tutoring, academic workshops (once a semester) and conversation sessions. We would like to emphasize that the aim of this support structure is to assist learners in their engagement of successful unguided language learning activities. Physical resources are at the core of the system and students interact mainly with technology and materials, and if needed or available, with tutors. These resources determine the work areas of the center. Three areas are devoted to the use of multimedia equipment and technological resources: audio, video, and computer rooms. Another area is devoted to reading and writing; it includes printed materials. There are two rooms for conversation sessions and a tutoring office. Students have direct access to most materials; only access to computers and software, movies, board games and some books is controlled by staff. Occasionally, there are time restrictions in the video and computer rooms according to the demand of these spaces. According to the coordinator of this center (A. Quintana, personal communication, June 10, 2010), materials have been acquired through different means and have different formats. Table 2 summarizes the way the materials were acquired for the centre. Few materials were adapted by the staff or bought specifically for use in the center; the majority were donated either by students or publishers. Most of these materials are printed; there are few with electronic format. The majority are didactic either in their original format or adapted; only 30 percent are authentic. We contrasted the features we found in the materials at the center with the desirable features of self-access materials provided by Reinders and Lewis (2006). We consider these features are crucial for self-directed learning (Table 3). We found the majority of the materials did not meet the features suggested by these authors. The inventory of materials revealed that only a few were specifically designed for the SAC. The coordinator could not specify the exact number of self-study books available, but she commented there are not many. 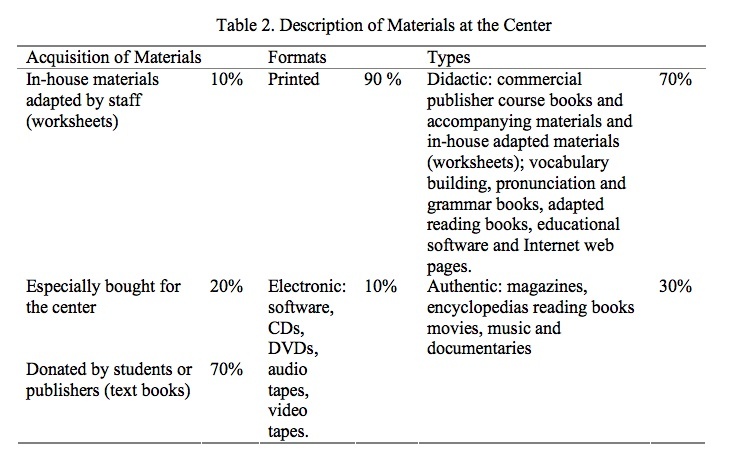 This may be a consequence of few materials being purchased specifically for use in the center, as indicated in Table 2. Many of the materials were either didactic for classroom use or were authentic, inherently not designed with a language learning purpose. The cataloguing system should aid student decision-making in the selection of materials (Reinders & Lewis, 2006). Analysis of the materials in the center presented many inconsistencies. Materials were catalogued in different ways. For example, the index code might begin with the language (E=English), the type of material (GB= grammar book), the skill (R-reading) or a number (001). The code might include a combination of all these elements or just some of them. The catalogues were named by the type of materials (worksheets, movies, video, etc.) or the name of the area (reading, listening, or computer). There was one printed catalogue in each area located in a tray, on a shelf or in a bookcase, next to the listed materials. Consequently, students did not access to a comprehensive, general catalogue, but had to go to each area to consult what was available. Catalogues were only printed; there was no digital database of material. Of the 12 students observed, none consulted the catalogues; they went straight to the areas they wanted to work in. In interviews with the students, most indicated a good attitude towards the center and the materials. Ten students commented that the center facilitates their development of language skills such as listening and speaking, especially pronunciation. Nine students said they attended the center because it was a requirement of their English course, although that did not necessarily preclude them saying that they thought it would facilitate their language learning. Students noted the quantity and the quality of the materials in terms of their perceived usefulness for language learning and their physical appearance: “I like that there are many materials for audio, video, movies”. “I come to the center because there are books, dictionaries. We have videos, we have movies, staff that helps us and there are many things to learn”. Of the students interviewed, four thought the amount of materials was adequate, four said they were useful, and 12 mentioned the center was functional and nothing was lacking. One mentioned he enjoyed having all the materials at hand. Physical appearance of the materials, especially their being in poor condition, was mentioned by four students. They said there was a need to buy new materials because some of them were worn out. Organization was noted by two students who mentioned that the order of materials had to be improved because sometimes they could not find them. This last comment refers to the fact that students do not return the materials to the shelves and there is not enough staff to put them away. The lack of a comprehensive catalogue of materials and lack of consistency in coding the materials was not mentioned by the students. Access to the materials was not perceived as a problem. During the observations, we identified literacy events in which students engaged in guided and unguided activities. This included noting what kind of textual material was involved. The analysis of those literacy events, the interviews, and the materials themselves, allowed us to document what students do with materials, how they make their decisions about those materials, and what could be improved to promote self-directed language learning. In the reading and writing area we observed four students. Two worked by themselves and two others with their classmates. One of them completed exercises in her notebook to study for her English exam that day. Another reviewed his notes in his English subject notebook and completed exercises contained in five grammar worksheets with the help of a translation program on his personal cell phone, while studying for his English exam with other classmates. The third student read an adapted novel with the help of a dictionary to understand unknown words. The fourth student played a board game, Scrabble, with his peers who had decided what to do in the center that day. While playing they used their native language to communicate and bilingual dictionaries to find words for the game board. They built 15 monosyllable words in English. Observations were made in two multi-media rooms. In the video room, the two students watched movies in English. One of them used the subtitles feature of the movie in Spanish. Two girls were observed in the audio room, and they both used didactic materials. One used a pronunciation book with its recordings in CD format. She listened and repeated all exercises in the book. The other girl chose an auditory ESL magazine to listen to and intended to read along as the articles were read aloud. She had problems locating the recordings and the texts. In the computer room, one of the students completed exercises of pronunciation using educational software, listened and repeated songs. She jumped from one to another program exploring their contents and completing exercises when she understood what to do. She looked for help to manage the computer programs but she did not receive any. The other student completed listening reading comprehension, grammar and vocabulary exercises using educational software with ease. In the conversation room, the two students attended traditional conversation group sessions where tutors organized the activities that included the selection of materials. One conversation tutor used a worksheet with problem solving activities and the other one used the reading sections of an English course book. In this session, the students read and answered the tutor’s questions. I think they [movies] help me understand the language, to understand the words because sometimes when a person speaks English we do not understand very well or we misunderstand the words. I think they [materials] help me identify the words. It seems students made decisions mainly based on the affordances they perceived in the materials. They identified that they can learn different aspects of the language and this gave them a sense of purpose when using materials. In total, we identified five criteria that students used for choosing to work with specific materials during their visit to the center (Table 4). It is important to clarify that respondents gave long answers which sometimes fell into more than one category, so the frequency of responses in Table 4 refers to the number of students who mentioned that reason. The most common reason, reported by nine out of the twelve students, was they chose the materials because they would help develop language skills. Having a pleasurable experience, which ranked second, was mentioned by a third of the students. These findings give the impression that students value the affordances these materials provide for learning the language. However, the observation and the interview data suggest that not all decision-making was consistent with an understanding of how best to use those materials, including their criteria for the selection of materials. For example, some students played Scrabble to reinforce vocabulary in a fun way and to interact with classmates. The words they created on the game-board were in L2, but their communication was in L1 and not English, suggesting they did not fully understand the role of the game to support their language learning. Then students said they chose materials to have a good time and to comply with the requirement to use the self-access center. It is not clear to what extent they were also learning. Without an expressed language learning purpose, it seems they were simply passing time or engaging in an everyday practice, such as watching a movie. It was not clear whether they chose materials because they were familiar with them and felt more comfortable or because they valued their learning potential. The students did not consult with center staff regarding material choices, nor did the staff seem to provide any such guidance. We infer that because of the lack of training and guidance students receive in the center, they could hardly have made informed decisions regarding material choice. According to Sturtridge (1997), materials have to be adapted for self-access use, and special attention has to be paid to their range and arrangement to facilitate their use, access and selection. 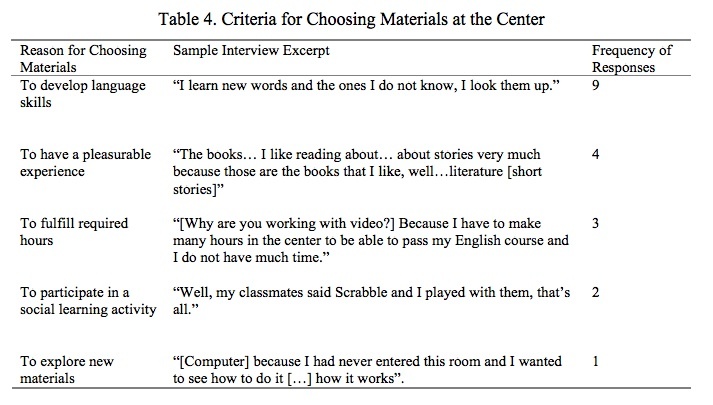 Some authors (Tomlinson, 1998; Gardner and Miller, 1999; Reinders and Lewis, 2006) have suggested criteria to develop or adapt materials to facilitate autonomous language learning because there are affordances expected of materials in a self-access centre that are different from the teacher-guided classroom setting. The ideal features of self-access materials developed by Reinders and Lewis (2006) (user-friendly cataloguing system, instructions of use, answer keys, etc.) were used as a point of comparison with the materials of this center, as shown in Table 3 above. Most of the materials do not meet the ideal features. It was the in-house adapted materials that were the most suitable and most congruent with the intended literacy practices of this social context. Unfortunately, the in-house adapted materials represented only 10% of all the materials in the center. We found that while there was an abundance of materials in the center setting, and students made use of them, there was no evidence of a structured learning plan. Neither the materials were consistently organized to afford such learning, nor did the students conceptualize their learning with a plan. Rather, the center provided materials for learning activities, but the opportunities for greater affordance were not evident in the observations made. Holec (1981) explains that to take charge of one’s learning implies the responsibility to make decisions about all aspects of learning such as the pace, the when and where, the materials, monitoring, and assessment. If students are to be autonomous, they are then responsible for making decisions for the selection of materials. However, the selection may be made by their own choices, selected through consultation with an expert (advisor/mentor), or negotiated with teachers or tutors. In this study, we found that the students decided to make their own choices and chose materials all by themselves and, as we noticed in the interviews, because they thought those materials would help them develop their language skills. This decision-making behavior indicates that students shared the inferred knowledge and understanding of the center, that they are supposed to work autonomously without the direct help of the teachers as most of them did. In summary, we see a social context of autonomous learning where students are not fully supported. The materials are not wholly sufficient due to the lack of full adaptation to this context. Most students have a specific language learning focus for the visit to the self-access center, and they rely on their own judgments and the inconsistent organization of materials to access useful ones. They take advantage of the materials’ affordances despite the lack of systematic organization or adaptation. We can also identify a phenomenon where some students come to the center and put in time to fulfill their course requirements, but it seems they do not move beyond what is familiar or entertaining in their language learning experience. With this New Literacy Studies approach, we obtained rich data about this self-access center supporting structure that allowed us to identify its visible and inferred elements. We were able to analyze the literacy events that the students performed because we could identify the relationships among the visible elements (participants and artifacts) and inferred elements (the opinions and understandings of the students about their work at the center). As part of that interaction, we found that the materials, an important element of self-access centers, require special attention because they represent the main artifacts students interact with when learning independently. We noticed that not all of the materials fit into this social context because they lack the features to support self-regulated learning. The inferred elements that students contribute to the literacy events performed became overt in the interviews. Sometimes students do not have a clear purpose and direction when choosing materials because they need more information. Their motivation to attend the center might not be to learn the language in an autonomous manner, but to fulfill a requirement. Nonetheless, all the students have certain criteria to make their choices; they focus on their language needs and their perception of the affordances of the materials to the degree they understand them. Finally, we would like to emphasize that this study does not aspire to generalize to all self-access centers; instead, it highlights how a New Literacy Studies framework can illuminate the learning afforded in self-access centers. Guided by that framework, our analysis shows that the structure of this particular center is not supporting students in key areas such the access, choice and use of materials. These aspects deserve improvement for students to be provided with a full supporting structure that assists them in achieving their language learning goals at the center. María del Rocío Domínguez-Gaona is a lecturer in the BA in Language Teaching and the Master in Modern Languages of the Universidad Autónoma of Baja California. She is also a Ph.D. student in Educational Science. She has worked in and conducted research in the self-access project of the Language School since 1994. Guadalupe López-Bonilla is a Professor of Literacy Studies at the Universidad Autónoma of Baja California and leads a research group focusing on discourse, identity and educational practices. She co-edited Discourses and Identities in Contexts of Educational Change (Peter Lang, 2011) and has published extensively on high school literacy practices and critical discourse analysis. Karen Englander is a Professor in the Faculty of Languages of the UABC, Ensenada, where she researches the literacy practices of monolingual and multilingual scientists. Her work has appeared in the Journal of Language, Identity and Education, Written Communication and Discourse Studies and she co-authored Scientific Writing in a Second Language. Benson, P. (2001). Teaching and researching language learning. London, UK: Longman. Dam, L. (2000). Evaluating autonomous learning. In B. Sinclair, I. McGrath & T. Lamb (Eds. ), Learner autonomy, teacher autonomy: Future directions (pp. 48-59). Harlow, UK: Pearson Education. Gee, J. P. (1996). Social linguistics and literacies: Ideology in discourses. New York, NY: Falmer Press. Hamilton, M. (2000). Expanding the new literacy studies; Using photographs to explore literacy as social practice. In D. Barton, M. Hamilton & R. Ivanic (Eds. ), Situated literacies. Reading and writing in context (pp. 16-33). New York, NY: Routledge. Holliday, A. (2007). Doing and writing qualitative research (2nd ed.). London, UK: Sage. Jones, F.R. (1993). Beyond the fringe: A framework for assessing teach-yourself materials ab initio English-speaking learners. System, 21 (4), 453-469. Plan de Trabajo del Centro (2003). Facultad de Idiomas, [Mexican University]. Reglamento de Centro (n.d.). Facultad de Idiomas, [Mexican University]. Sturtridge, G. (1997). Teaching and learning in self-access centres: Changing roles. In P. Benson & P. Voller (Eds. ), Autonomy and independence in language learning (pp. 66-78). Harlow, UK: Longman.